During the 1860s there were only rough trails leading into Central Otago and cavalcades of prospectors followed these inland. The first re-enactment of a goldfields cavalcade was in 1991, and their popularity has grown with a different trail followed each year. In 2005 the trail led from Kingston at the southern end of Lake Wakatipu to Wetherstons near Lawrence, and took six days. 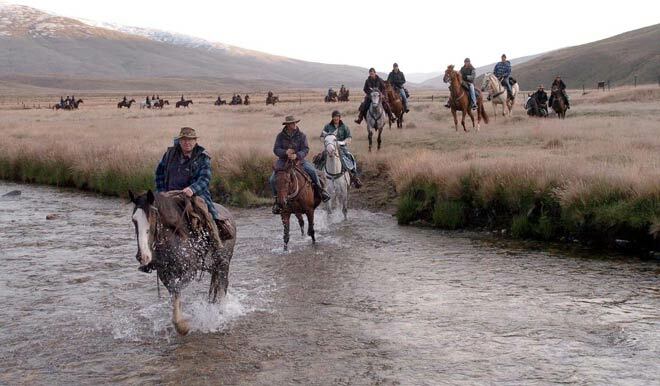 Here, David McAtamney leads horses across the Roaring Lion Creek in the Nevis valley at the end of the first day of the cavalcade in March 2005.